Docking piglet tails: How much does it hurt and for how long? By Pierpaolo Di Giminiani, Abozar Nasirahmadi, Emma M. Malcolm, Matthew C. Leach, Sandra A. Edwards. 2017. Physiology & Behavior 182: 69-76. 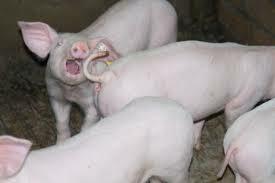 • Short and long-term behavioural changes due to tail docking in pigs are described. 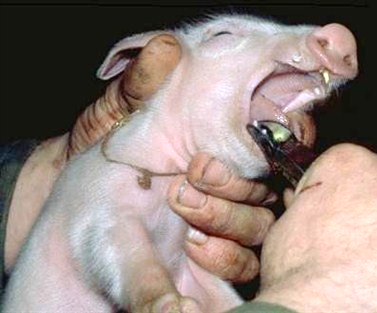 • Vocalisations suggested the procedure to be painful for piglets. • The behaviour sampling adopted detected no changes up to 2 days post-tail docking. • Long-term effects of tail injury on mechanical nociceptive thresholds were absent. Tail docking in pigs has the potential for evoking short- as well as long-term physiological and behavioural changes indicative of pain. Nonetheless, the existing scientific literature has thus far provided somewhat inconsistent data on the intensity and the duration of pain based on varying assessment methodologies and different post-procedural observation times. In this report we describe three response stages (immediate, short- and long-term) through the application of vocalisation, behavioural and nociceptive assessments in order to identify changes indicative of potential pain experienced by the piglets. Furthermore, we evaluated the following procedural differences: (1) cautery vs. non-cautery docking; (2) length of tail removal. Sound parameters showed a significantly greater call energy and intensity exhibited by docked vs. sham-docked piglets (P < 0.05). Observations of general activity of the animals in a test situation failed to detect a difference among treatments (P > 0.05) up to 48 h post-tail docking. Similarly, no difference in mechanical nociceptive thresholds indicative of long term pain was observed at 17 weeks following neonatal tail docking (P > 0.05). The present results highlight the potential for the use of measures of vocalisation to detect peri-procedural changes possibly associated with evoked pain. Nonetheless, activity and nociceptive measures failed to identify post-docking anomalies, suggesting that alternative methodologies need to be implemented to clarify whether tail docking is associated with short- and long-term changes attributable to pain experienced by the piglets.